Paris 1928. Lucia, the talented and ambitious daughter of James Joyce, is making a name for herself as a dancer, training with many famous dancers of her day and moving in social circles which throw her into contact with Samuel Beckett. Convinced she has clairvoyant powers, she believes her destiny is to marry Beckett, but the overbearing shadow of her father threatens this vision. Caught between her own ambitions and desires, and her parents’ demands, Lucia faces both emotional and psychological struggles that attract the attention of pioneer psychoanalyst Dr Jung. I’ll be honest: other than the fact that he’s a literary great who wrote a book that nobody seems to like but everybody seems to feel as though they should try reading, I know very little about James Joyce or his life. I guess it follows that I knew even less about his dancing protégée of a daughter, Lucia. 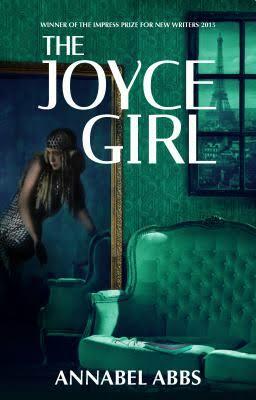 Something about the description of The Joyce Girl really got my attention though. A fictionalised account of Lucia Joyce’s life as a dancer and of her struggles with mental illness, filling in the gaps around letters and other real life records of Lucia’s life. The novel opens in 1934 with Lucia talking to a psychiatrist before swinging back to the late 1920s and letting the story of how she ended up there unravel. Most of the novel is set in 1920s Paris and the sense of time and place is really stunning. Annabel Abbs manages to perfectly capture the conflict between the freedom that young women were starting to experience in post-war Europe with the restraint of the traditional ideals that older generations were clinging to. Lucia wants to be a famous dancer and celebrated choreographer with a life full of romance; her mother wants her to give up her improper ‘hobby’ and settle down with a steady young man from a ‘good’ family. The clash of ideals is a constant source of tension in Lucia’s life and one that affects almost every aspect of her life. The issues with Lucia’s mental health develop gradually and are subtly explored. The early signs are quiet and it’s easy to take them as part of Lucia’s passionate nature. She meets Samuel Beckett relatively early in the novel and becomes besotted. Her daydreams of true love and a ‘happily ever after’ are charming and I’m sure we’ve all been less dignified than we’d like in the face of romance at one time or another. The development of Lucia’s jealousy over Beckett’s fascination with her father and the anger at intrusions into their budding love feel entirely realistic. Every step that takes Lucia from being an open and happy young dancer to being a tragic figure in a psychiatrist’s office is completely believable and my heart hurt to read it. What’s really clever is that not only does Annabel Abbs manage to show Lucia’s flaws, she shows the actions of Lucia’s family and friends feeding those flaws and insecurities and driving her downward spiral. She is let down repeatedly but never in a way that seems melodramatic, just in a way that I can imagine all too easily happening to many girls of her age in her era. One final gushy point and then I’ll stop: I’m no dancer but even I loved the writing about that side of Lucia’s life. How real it made the gruelling hours of training and the sheer uncertainty of ‘making it’ in a creative field where what is ‘great’ is subject to individuals’ whims. Less dreamy twirling, more bleeding toes and aching muscles. If I had one criticism, it was that that the chapters set in 1934 were a little repetitive. I expect that was intentional and it did reflect the monotony of Lucia’s life in contrast to her life as a dancer but it was a little jarring at times and I felt that it interrupted my enjoyment of the 1920s story a few times too many. That’s it. That’s my gripe. So what that really tells you is that I really enjoyed this book and will definitely be keeping an eye out for Annabel Abbs in the future. Overall: This is a lovely (if utterly tragic) novel and one that I do absolutely recommend despite it having taken me a ridiculously long time to getting round to talking about. The writing is wonderful and the story is heartbreaking. More so because it’s based on a true story. Bonus points for the cameo from Zelda Fitzgerald. And as if this wasn’t enough to make you buy a copy, all profits from first year royalties from sales of this novel will be donated to YoungMinds in memory of Lucia Joyce!